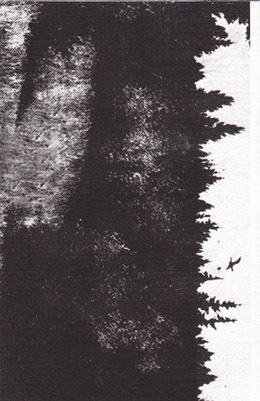 After I reviewed Til Det Bergens Skyggene's self-titled album, the artist contacted me, and very kindly sent me his three currently unreleased cassettes Renhet I, II, and Vandringen I (Skoglandskap). The former two tapes are quite good, very original and experimental, however the latter tape, the artist's most recent, is something else entirely. The moment I started listening I knew I was in for a glorious journey, and so has it been every time since. I would've reviewed this fantastic, nostalgic, pure symphony of dreamland much sooner, although I was hoping to do so once it was released, to hopefully get it more sales and listeners. The artist told me, however, that due to some technical difficulties in dubbing the tapes, it would likely be a while until they were released, and whether or not readers of this blog have access to it at the moment, I still feel it absolutely needs some words to be said about it. If the self-titled cassette of Til Det Bergens Skyggene had any problems, they are absolutely addressed and surpassed here. The music never seems to fall into heavy repetition, and yet the craftsmanship is evident, that so much thought went into every riff. In fact, this short cassette even transcends some of the best dungeon synth in that it has managed to create a tone and atmosphere that is distant and relaxed enough to allow the listener's mind to wander, exploring the visual landscape that grows out of the atmosphere of the music, an important trait that all good dungeon synth should have; but then what makes these songs so wonderful is that they are also complex and active enough that close focus upon the music itself is moving and enjoyable, something which most dungeon synth fails to achieve. Somehow Vranevorn has managed to achieve the contemplative serenity which distinguishes the genre without resorting to excessive repetition or simplicity. The sound of the synths themselves could not be more perfect. It is clear that the artist has a love for the sounds of such instruments, the deep, strange, otherworldly quality that can transport a listener to undiscovered vistas. I wouldn't just recommend this tape to listeners of dungeon synth, I would also highly recommend it to people who love synthesizers in general. Of course I mean vintage synths, from the eighties and nineties, but I'm not sure people who dislike such sounds could even be called "synth lovers." This short span of slightly less than a half-hour of music is a feast of the mysterious warbling, shimmering, groaning, and crystalline sounds of these electronic gateways to the mystical realms. One could look at the synthesizer as a mere machine, or as a mere instrument, depending primarily on the craftsmanship of the maker or the skill of the musician, however that is not how I see it, and I believe that is also not how Vranevorn sees it. To me, I think the synthesizer is a doorway into an unknown and alien landscape, discovered rather than created, like the monolith discovered by the apes in 2001: A Space Odyssey. Too many people have failed to recognize what can be seen through the blurry window of these "vintage" instruments, moving on to the "new" sounds. Artists like Til Det Bergens Skyggene instead stick around and attempt to clean that window, to give us a better view into that fantastic place, which of course can only truly be described through music, making my task of putting it into words quite difficult. This album makes you think, but it is also tremendously enjoyable to listen to. It is the kind of music that you would have no problem listening to several times in a row. And still, it's the kind of work that I highly doubt would ever get worn down and forgotten (even though that is ironically part of the atmosphere, that it feels like a faded, dusty tome in hidden corner of an attic of a deceased great-grandparent). It is filled with such great longing, such profound memories, such yearning nostalgia, that I doubt anyone could not feel the bittersweet memories that never were, as fleeting and powerful as one's imaginary memories in a dream. I apologize if my praise might seem a bit over-the-top, but even though I've given this tape plenty of listens, I'm still somewhat caught off guard by it. To my ears it stands tall next to the greats of the early nineties, Mortiis and Wongraven, and I was honestly not expecting this genre to ever progress in such a way. Though I don't believe the artist has too much influence from other dungeon synth musicians, I think it is still quite clear that he is tapping into the same vein, and coming in from that different angle has perhaps given him an advantage, creating very original and magical sounds within this style. I must also apologize for whetting your appetites, since I know very few readers will have any access to this work. I suggested to Vranevorn, if he could not release it physically, that he might consider releasing it online, and he made it quite clear to me that this was unacceptable, not only sticking to the old ways of vintage synths but also the nostalgia physically tangible music. So, keep an eye out for the release of this tape, and I guarantee you will not be disappointed in purchasing it. Hey Andrew. Anything similar to Til Det Bergens Skyggene you'd recommend? You made me buy the tapes, I love them. Hey, I'm glad you liked them, but to be honest I couldn't really name another ds artist close to TDBS's lush synths. He's got a much more analog sort of sound, while most dungeon synth tends to go for the digital/sampling tones. That's one of the reasons why I like this artist a lot, he's channeling the ds moods from a different direction. So the only other thing I could really suggest is the recent first release from the artist's new project, Yearner (which I should be reviewing soon). Voldsom has got a bandcamp page now, for those not being able to listen on cassette devices. Just discovered this projct, imbelievable ambient, uually a genre that I think is misused and because of that it has a reputation for being boring and without substance. I have only listened to 'Til Det Bergens Skyggene' but I love it. He seems to be coming back sometime this year, hopefully with more tapes available.